(Mission Network News) — On Friday, the Iraqi government announced its security forces had regained full control of central Fallujah. Although this news would seem like an improvement on prior circumstances, it doesn’t do much to help the on-going refugee crisis. However, Global Aid Network is trying to find ways to help refugees, particularly children, right where they are. GAiN already tries to provide humanitarian relief for refugees. 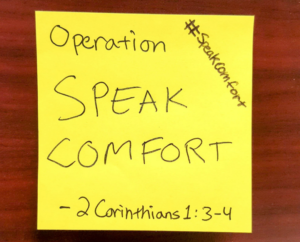 But now, as part of one of its initiatives, GAiN will be providing notes of encouragement and comfort along with the aid as part of the ‘Operation Speak Comfort’ initiative.